Diabetes is a growing epidemic in the United States and abroad. The American Diabetes Association (ADA) reports that more than 23 million children and adults in the United States are living with the disease (about 8% of the population), roughly 7 million of whom are unaware of their condition. Now multiply 23 million by three and you’re close to the number of people living with prediabetes (79 million). The term “epidemic” is not an overstatement. With the diabetes ranks increasing by another 1.5 million each year, “The World Diabetes Foundation estimates that there will be more than 438 million people worldwide with diabetes by 2030,” says Edward Chaum, MD, PhD, the Plough Foundation Professor of Retinal Diseases at the University of Tennessee Hamilton Eye Institute in Memphis. “The Centers for Disease Control and Prevention estimates as many as 110 million Americans will have diabetes by 2050.” To better illustrate what that means, that’s one in every three adults in the country by 2050. Diabetes in itself can present many challenges for clients, yet poor blood sugar management can lead to a host of complications that can affect many bodily systems, the eyes being one and a major source of concern. Diabetes is the leading cause of new cases of blindness among adults aged 20 to 74, according to the ADA, and diabetic retinopathy is the main culprit. “Diabetic retinopathy is the most common diabetic eye disease and is a leading cause of blindness in American adults,” says Elva Parker, MS, RD, CDE, a diabetes educator at Unity Diabetes Center in Rochester, New York. How common is it? Approximately 4.1 million adults aged 40 and older have diabetic retinopathy, with one in every 12 diabetes patients in this age group presenting with advanced, vision-threatening retinopathy, according to a 2004 analysis in the Archives of Ophthalmology. However, a diabetes diagnosis alone isn’t a thin-veiled threat of future blindness. Blood sugar management plays a huge part in whether diabetes patients will develop blinding complications, especially diabetic retinopathy. If future projections hold true, dietitians will soon see (if they haven’t seen already) an increased number of clients presenting with diabetes as well as a growing number of patients with diabetic retinopathy. 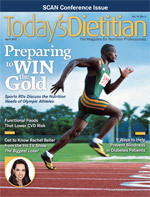 Dietitians may not be equipped to diagnose this condition in their diabetes patients, nor should they be, but by educating them about this potential complication and opening up the lines of communication with eye doctors, nutrition professionals can play an important role in preventing blindness from diabetic retinopathy. “Diabetic retinopathy is a condition that involves damage to the retina due to diabetes,” says Abdhish R. Bhavsar, MD, a retina specialist and surgeon at Retina Center of Minnesota and a clinical correspondent for the American Academy of Ophthalmology. Explaining that the retina is a highly specialized thin membrane that contains more than 100 million individual photoreceptors, Phelps makes a photographic comparison to better illustrate the concept. “[The retina] is like the film in a camera yet is highly active and requires good circulation and nutrition to keep it active and healthy. Diabetic retinopathy is where there’s some damage to the circulation in the microvascular network disallowing the retina to actively function,” he says. People in the early stages of diabetic retinopathy may not notice any changes in their vision. “In the initial stages of diabetic retinopathy, patients may be asymptomatic, but in more advanced stages of the disease, patients may experience symptoms that include decreased or blurred vision, visual distortion, and floaters,” Chaum says. Without proper intervention, irreversible damage can occur. “With time, diabetic retinopathy can get worse and cause vision loss,” Parker warns. • Y is for hYperglycemia. “The chronic higher levels of glucose in the blood start to cause damage to the internal cell wall of the fine capillaries that feed the retina,” Phelps says, noting that this is best measured by A1c levels. • M is for Microvascular abnormalities, which start to form in the retina because of the damage to the capillaries. “Capillary nonperfusion starts to damage the retina,” he adds. • C is for Chemical mediators (known as vascular endothelial growth factor, or VEGF) that are released from the damaged retina and stimulate the growth of new blood vessels. • A is for Abnormal adhesive new vessels. When formed, the new vessels can easily bleed and cause traction on the retina, which then can lead to traction retinal detachment, Phelps explains. The longer someone has diabetes, the more likely he or she will develop the condition. Yet it’s anything but a sure thing for diabetes patients as long as good glucose control is a mainstay of their disease management, Phelps says. “A well-controlled person with diabetes who does not have the higher chronic levels of glucose in the blood generally will have less or even no diabetic retinopathy,” he says. Parker notes that this condition is of particular concern for diabetes patients who are pregnant. “During pregnancy, diabetic retinopathy may be a problem for women with diabetes. To protect vision, every pregnant woman with diabetes should have a comprehensive dilated eye exam as soon as possible,” she says. There are two different types of diabetic retinopathy: nonproliferative and proliferative. “Nonproliferative diabetic retinopathy involves dot/blot hemorrhages in the retina and is the beginning stage of diabetic retinopathy,” Bhavsar says. Phelps says this stage can be moderate or severe and in its mild form may not affect a patient’s vision at all. Proliferative retinopathy involves the formation of new abnormal blood vessels in the retina or in the vitreous (the gelatinous substance that fills the center of the eye) that threaten sight and are in need of treatment, Phelps says. “This can lead to the eye filling up with blood, vitreous hemorrhage, or traction retinal detachment as the abnormal vessels pull on the retina,” Bhavsar says. Bhavsar describes CSME as another cause of vision loss, resulting from microaneurysms leaking blood, fluid, and lipids into the retina. When fluid leaks into the center of the macula (from which we obtain sharp, central vision), the macula can swell, blurring vision. CSME can occur at any stage of retinopathy, Phelps says, and about one-half of patients diagnosed with proliferative retinopathy also have macular edema. Bhavsar says a complete ocular and retinal exam is needed to diagnose diabetic retinopathy. Ophthalmologists or optometrists can perform this exam. But even more significant than how patients are diagnosed is how many aren’t being diagnosed—at least during the early stages when the condition is most treatable. “It’s almost never diagnosed by the patient noticing poor vision unless it’s at an [advanced stage],” Phelps says. “The dilated eye exam is how it’s found, then special testing with fluorescein angiography and optical coherence tomography can help guide the level of care or treatment needed,” he says, adding that diabetes patients should have a dilated eye exam at least once per year. During the early stages of diabetic retinopathy, treatment often is unnecessary unless patients present with macular edema, although laser surgery sometimes can be used to preserve vision in some diabetic retinopathy cases. “Treatments with laser can effectively preserve vision in patients with diabetic retinopathy if disease is diagnosed at an early stage,” Chaum explains. He says proliferative retinopathy typically is treated with a procedure called scatter laser treatment; macular edema mostly is treated with focal laser treatment. If the bleeding is severe, Chaum says patients may need a surgical procedure called a vitrectomy in which the vitreous is removed from the center of the eye so the surgeon can eliminate the blood in the back of the eye. Parker notes that patients with proliferative retinopathy can reduce their risk of blindness by 95% with timely treatment and follow-up care. More recently, Chaum says an ocular telehealth network he and his colleagues developed at the University of Tennessee Hamilton Eye Institute in collaboration with Oak Ridge National Laboratory is using telemedicine to reach the growing number of patients with diabetes who require diabetic retinopathy screening. Startup companies such as Hubble Telemedical’s TRIAD network are using new image analysis methods to expand diagnosis and management of diabetic retinopathy to reach more people, particularly in populations with health disparities, Chaum says. Yet make no mistake: The best treatment for diabetic retinopathy is prevention (either prevention altogether or prevention of disease progression in patients who already have diabetic retinopathy), which stems from good glycemic control. 1. Advocate for good glucose control. Even though this is nothing new for RDs and CDEs who are used to working with diabetes patients, Bhavsar says this is where nutrition professionals can have the greatest impact in managing or preventing diabetic retinopathy. “The most important way RDs can help diabetes patients is to help them optimize their blood glucose control. This is the single most important factor in the onset and progression of diabetic retinopathy,” Bhavsar says. Phelps says nutritional guidance is crucial in preventing or managing the condition, “especially since 90% of those with diabetes have type 2 and usually associated with an overweight condition,” he says. 2. Cite the numbers for better clarification. If you’re looking for concrete numbers to bolster your argument for why patients should care about good glucose control, Jean Bauch, RD, CDE, director at Unity Diabetes Center, can help. “The Diabetes Control and Complications Trial [DCCT] can be referenced to help the patient understand that improving glycemic control can go a long way in preventing retinopathy,” Bauch says. The study Bauch refers to is a major clinical study conducted from 1983 to 1993 (with follow-up of 90% of participants continued after 1993 in the Epidemiology of Diabetes Interventions and Complications [EDIC] study) funded by the National Institutes of Health, which compared the effects of standard blood glucose control vs. intensive control on common diabetes complications. Intensive control was referred to as patients’ sustaining hemoglobin A1c levels as close as possible to the normal value of 6% or less, according to the study. Researchers showed that better blood glucose control resulted in slower onset of a multitude of diabetes complications and that any blood glucose control (even if it wasn’t sustained over a long period of time) helped. This is particularly relevant for patients who may have shown poor blood glucose management in the past and may be inclined to think it’s of no use to change behavior now. With regard to diabetic retinopathy, the study showed that intensive glucose control reduced the risk of developing the disease by 76%. Better management of glucose control also proved to slow the progression of the disease by 54% for patients who started the study with some form of eye damage present. 4. Identify and address barriers to care. While some patients may avoid an annual eye visit because they lack motivation, others may have the desire to go but run into obstacles. Bauch says RDs are in a good position to identify and address these barriers. 5. Initiate relationships with local eye doctors. In her experience, Bauch says ophthalmologists have shown interest in collaborating with a larger healthcare team. “RDs should feel comfortable approaching these physicians about the care of their patients with diabetes and identifying ways to work together,” she says. Phelps recommends making contact with area eye doctors to facilitate improved communication. “I’d recommend RDs ask their patients which eye doctor they see. In any given geographic area, common doctors’ names can be put on a list,” he says. In addition, Phelps suggests RDs stop by eye doctors’ offices or call and set up a short meeting to discuss what each health professional can do to improve disease management for diabetes patients. Phelps recommends using a form similar to that below. This way, RDs can refer diabetes patients to local eye doctors for annual appointments, if necessary, and eye doctors can refer diabetic retinopathy patients to RDs for nutrition guidance. “Most eye doctors would like to have a referral source if problems are starting in the eyes and A1c levels aren’t controlled in their patient,” Phelps says. 6. Keep track of patients’ general eye history. While most eye experts interviewed didn’t think it was necessary for dietitians to keep track of patients’ eye exams and treatments, Phelps says a general knowledge of patients’ eye history can only help in preventing (or managing) diabetic retinopathy. “Any participant on the management team for a patient with diabetes should be at least generally aware of the eye exam history and level, if any, of diabetic retinopathy for each patient,” he says. 7. Encourage regular eye exams. Noting that tracking eye history is mainly the physician’s job, Chaum says encouragement from RDs in keeping routine eye exam appointments or obtaining exams through local screening or telemedical programs can be beneficial for patients. While treatments exist to effectively preserve vision in patients with early-stage diabetic retinopathy, “Even in managed healthcare organizations, only about half of all diabetics receive the recommended yearly eye exam,” he says. Phelps also suggests RDs consider inviting an eye doctor to a local dietitian meeting to broach the topic for a wider range of dietitians who may or may not be knowledgeable about the specifics of diabetic retinopathy. 9. Give patients the good news. As Chaum explains, many patients don’t inherently know that a diabetes diagnosis doesn’t equal vision loss on its own. “There’s a misconception among many, if not most, patients that vision loss is an inevitable result of diabetes,” he says. “I’ve had young diabetics in my practice tell me that they’ve always known that they’d go blind from diabetes because a parent went blind from diabetes. Nothing could be further from the truth.